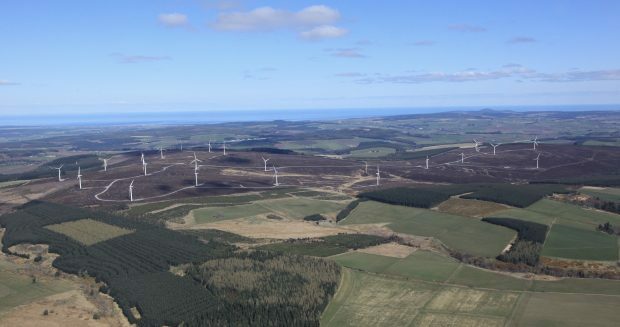 A Moray wind farm is poised to undergo expansion, despite councillors objecting to the development and launching a public inquiry. Renewable Energy Systems (RES) tabled plans to expand the Hill of Towie site, near Drummuir, from 21 to 37 turbines more than three years ago. But Moray Council’s planning committee raised an objection to the extension – and urged the Scottish Government to knock it back. However, the scheme has now been given the go-ahead by SNP ministers and a construction programme for the new turbines – measuring up to 400ft tall – is being devised. Head of projects for RES, Simon Peltenburg, christened the project “Hill of Towie II” as he welcomed the decision. He said: “Onshore wind is now the cheapest form of any new generation, bar none, and Hill of Towie II will therefore play an important part in helping to make the important transition to a low-cost, low-carbon future for Scotland. Proposals to expand the wind farm between Keith and Dufftown originally came before Moray Council in February 2014. Members of the planning committee tied at 5-5 when debating whether to object to the scheme. The then chairman of the group, Douglas Ross, used his casting vote to pave the way for an objection and trigger a public inquiry. Mr Ross is now MP for Moray and yesterday slammed the government’s decision to approve the expansion as “undemocratic”. He said: “Locally elected councillors took a democratic decision to object to this expansion, and the public will rightly question why SNP ministers think they know best, and are pressing ahead regardless. Mr Peltenburg stressed that the new turbines will be “carefully designed”, and will utilise much of the existing infrastructure during construction to minimise disruption. Design firm LDA added that such analysis had helped mitigate the concerns raised by councillors. The upcoming work will increase the wind energy produced at Hill of Towie to 48MW – enough to power more than 26,000 houses a year. It is expected that, during construction and its first year of operation, Hill of Towie II will create more than £4.4million of inward investment.